You are currently browsing the tag archive for the ‘course’ tag. Youngsters with dreams of tearing up the track represented Great Britain at one of the largest motorcross beach races in Europe. Young bike enthusiasts from Medway competed in the Endurole du Touquest in France on 8 and 9 February – their first ever endurance race lasting a gruelling one and a half hours. Riders Patrick O’Neil, 16, from Strood and Jordan Chapman, 15, from Chattenden came in 37th and 93rd place out of 150 riders. The talented teens were supported by a trio of mechanics, Jack Staples, 18, from Chatham and Stuart Galloway, 18 and Charlie Knight, 16, from Gillingham, who managed the pit stop and kept the bikes in top condition. The boys were able to take part in such a prestigious race as part of Cyber Youth Connect (CYC) Youth Project, lead by Medway Council and funded by Interreg. The project works in conjunction with partners in France promoting English and French unity, and gives young people oppotunities to develop their skills and talents. Not only did the youngsters have a great time on their racing trip, it also provided them with a platform to put their newly learnt skills from the CYC programme into practice. Patrick said: “I’ve learnt different techniques, the way to move around the bike in the sand and how to perform and different ways to ride the bike. Because there are no sand tracks over here that’s why everyone goes to Dunkirk – it’s so hard and different out there. Jordan never thought he would have an opportunity to take part in such an event. He said: “Motor cross is something that I really enjoy doing, it’s been in my head ever since my dad bought me my first bike with I was two and a half. Since being selected for the race in August last year, the team prepared for the big event with Dover based motocross project MXCP, riding 125cc Suzuki bikes. Medway Council’s Portfolio Holder for Children’s Services Cllr Mike O’Brien said: “It is wonderful that teenagers from Medway were able to take part in a big competition like this abroad, alongside other young people engaged in similar programmes to CYC. Youngsters who would like to get involved with the CYC project can still do so as a variety of courses will be running until March 2015. CYC gives 11 to 19-year-olds an opportunity to gain skills and experience in music, cookery, motorbike mechanics and safe riding, as well as media including filming and photography. Teenagers can sign up to the new, online UCAS e-card scheme to receive valuable advice about applying to university and college. Get your heart racing and learn the tricks of the trade at an introduction to crime fiction writing at Gillingham Library. Crime and Mystery Twilight is on Tuesday, 21 May at 7.15pm. Tutors from The University of Kent’s access to higher education diploma will be offering this free taster session, with no obligation to carry on studying afterwards. Places on this free course can be booked by phoning 01634 337340. Two intensive summer fitness courses will run during August. Active IQ Certificate in Fitness Instructing (Level 2) runs from Monday, 5 August to Friday, 23 August from 9.30am to 4.30pm at Medway Park. For more details or to sign up contact Dan Mace at dan.mace@medway.gov.uk or 01634 338412. The course costs £523. Concessions apply. May be fully funded if you are a job-seeker. Explore the world of Shakespeare with Medway Community Learning. The course looks at the culture of Shakespeare and his actors by studying his plays and the conditions of Elizabethan theatre. This course combines theory and practical and leads to a performance. The world of Shakespeare course starts on Monday, 29 April at 7pm at Eastgate House, Rochester. The full fee is £86, concessions available. To enrol contact Medway Community Learning at http://www.medway.gov.uk/adultlearning or phone 01634 338400. 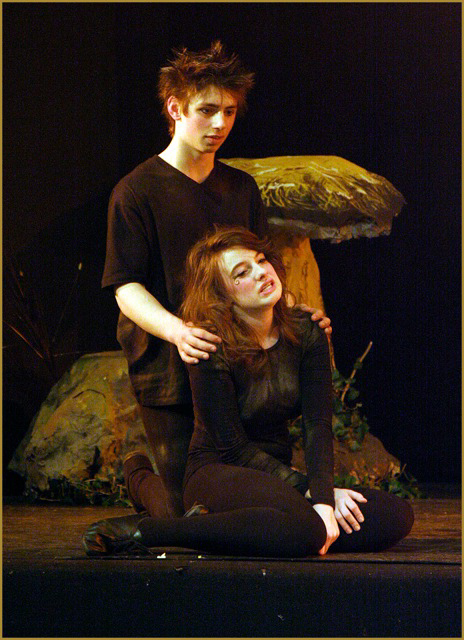 Two Brook Youth Theatre performers in a previous production. Wannabe young actors can learn the tricks of the trade and take the first step on the performing arts career ladder thanks to The Brook Youth Theatre. Run by Play on Words theatre company, place are now booking on the new 10-week summer term, which starts on Wednesday 17 April. Aimed at 13-18 year olds, the workshops will give young people the opportunity to work with industry professionals, develop drama skills and introduce them to important theatrical practitioners, writers and styles of theatre. Tap into your inner creative writer at a workshop with a Medway-based award-winning writer. Poet Philip Kane will lead the workshop entitled – What if? – at Medway Archives and Local Studies Centre where he will help guide wannabe writers into the art of creating alternative histories and parallel worlds, using the archive’s resources along the way. The workshop is on Saturday, 9 February from 12noon to 3pm at Medway Archives and Local Studies Centre, Clock Tower Building, Former Civic Centre site, Strood. Workshops costs £5 but places are limited so booking is essential, phone 01634 332714. Please bring your own writing equipment. As well as offering courses from beginners to advanced in French, Spanish, Italian and German. Medway Adult and Community Learning Service also has beginners courses available in Polish, Russian, Turkish, Arabic and Japanese. Why not give one a try. All courses take place at Gillingham Adult Learning Centre – except Russian, which is held at Rochester Eastgate – and they start from mid September.